Rambo III is possibly the dumbest movie I have ever seen. Many people give the second movie stick for being over the top, well this film takes it over the top and just keeps going. I was stunned by how dumb this movie was and when people talk about ‘dumb action movies’ this is the movie they should be talking about. 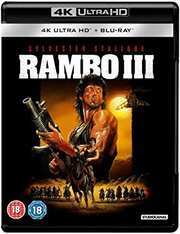 After the events of the previous film, Rambo has taken himself to a monastery in Thailand where he is once again looked to be recruited by Colonel Trautman for a dangerous mission. It seems that the Russians are trying to destroy the people of Afghanistan and they need Rambo to help deliver weaponry to fight the evil Russian enemy. Rambo refuses and going alone Trautman is captured. This leads to Rambo going in to rescue his friend and help the people of Afghanistan in an all-out battle of bullets, explosions and testosterone. Now, I will start by addressing the elephant in the room which of course is that technically Rambo helps the Afghan forces defeat the Russians and helps supply them with weaponry. In the context of its time the Afghan people were not enemy and so watching this back post 9/11 is a little strange to say the least. However, it does leave a bitter taste in the mouth, but I can mark this simply to ‘Product of its Time’ and just carry on. After getting that out of the way, the rest of the film is (as I said) the dumbest movie I have ever watched. It is not surprising that Hot Shots used this film as a template for making fun of for its sequel as the stupidity almost writes itself. Stallone is more wooden here than ever and I am not surprised that he won the Razzie for Worst Actor for what is an appalling showing throughout. The film itself is all over the place and I don’t even know what I am supposed to make of it. At times I was shocked at just how ludicrous and hammy most of it was. Whereas in the second film the evil Russians were wonderfully over the top these ones were almost Pantomime levels of bad. This was the kind of film that Tommy Wiseau would mock as bad filmmaking. The action is fine if you were looking for just Boom and Explosions, but the rest of the film is just appallingly bad. As with the other two releases the film comes with multiple extras which is nice, though as I have always said there’s nothing worse than watching a load of extras for a bad film. The Commentary by Director Peter MacDonald is fine for what it is. He was able to talk about how the film was made and make it interesting which was nice. The final part of Rambo takes the 80s is a great way to end this look at how Rambo affected that decade, although I would have preferred them release all three in one box set and just have this as one complete look at the Rambo phenomena. It also includes a short featurette 'Full Circle' which is basically the entire film condensed to six minutes with a dance beat over it. If you want to save youself about eighty minutes you could just watch this instead of the main feature. Interview with Sylvester Stallone (like MacDonald’s commentary) feels great like they were wanting to make a good film and there are some good intentions. He looks more at the original and how that was created and brushes over the two really quickly. Possibly, they knew what they were making was a dumb action film, but at the time that’s what people wanted. There is an Alternate Beginning which just throws you into an action scene with no rhyme or reason and is best that it wasn't there and over seven minutes of Deleted Scenes which don’t really add much to the film. Trautman & Rambo is a quick look at the two characters and is really a glorified trailer for the film. They also included the Original Trailer which is your typical 'show all the action' thing that most were like in the 1980s. Rambo III is a sad end to what started off as a great franchise (though it did warrant a slightly better sequel in 2008 and an upcoming sequel too). Unfortunately, this is the very definition of a ‘leave your brain at the door’ film and it simply is not good enough with its story or acting to warrant more than one watch. If you like loud explosions then you might enjoy it, but if you want something more than this is not the film for you.